Perfect for little hands!Melissa & Doug Jumbo Knob puzzles feature easy-grasp knobs for little hands and matching pictures underneath extra-thick pieces. 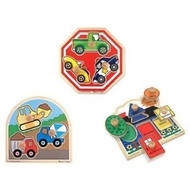 This bundle includes First Shapes Stop Sign Construction Site.Each puzzle contains large pieces perfect for grasping. These are great first puzzles and are a great activity to encourage hand-eye and visual perception skills.